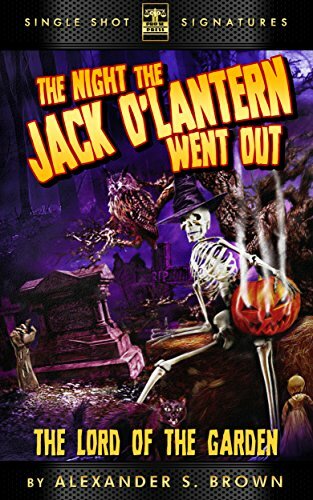 Pro Se Productions announces the newest installment of Author Alexander S. Brown's holiday themed supernatural horror series- LORD OF THE GARDEN, the second story in Brown's THE NIGHT THE JACK O' LANTENRN WENT OUT series, is now available as a Pro Se Single Shot Singature digital single. Halloween. A holiday that inspires memories, excitement, and a little bit of fear in everyone. A single day where all the ghosts and ghouls come out to play and sometimes it's hard to tell which of the creepy crawlies are human and which ones truly rise from beyond seeking unsuspecting souls. Author Alexander S. Brown explores all the wonderfully terrifying possibilities Halloween has to offer in his Pro Se Single Shot Signature Series- THE NIGHT THE JACK O’ LANTERN WENT OUT! Each month Brown delivers a new tale of terror laced with just enough nostalgia that makes us all hope Halloween comes sooner…and stays far enough away that the monsters don’t get us! Brown’s second tale, THE LORD OF THE GARDEN, recounts just what sort of sacrifice is required for success and growth sometimes when one unwittingly deals with the supernatural. Featuring Cover Art and Design by Jeffrey Hayes and digital formatting by Russ Anderson, THE LORD OF THE GARDEN is available at Amazon, Barnes and Noble, and Smashwords for only 99 cents. For digital review copies of this story, to interview the author, or for more information on Pro Se Productions, contact Pro Se's Director of Corporate Operations, Morgan McKay at directorofcorporateoperations@prose-press.com. To learn more about Pro Se, go to www.prose-press.com and like Pro Se on Facebook at www.facebook.com/ProSeProductions.